Lead-Acid batteries are power storage devices that are widely used in automotive, UPS, telecommunication, and for various other purposes in numerous industries and sectors. A lead-acid battery comprises four main elements: a positive plate which is covered with a paste of lead dioxide; a negative plate made of sponge lead; a separator made of insulating material between the two plates that allows the electrolyte and the ions into it to enable conduction without the two plates touching and an electrolyte consisting of water and sulphuric acid. This report on the global lead acid battery market has been compiled by a group of professional research analysts who are experts in the field of chemical engineering and the commerce of it, targeting audiences such as manufacturers of lead acid batteries, raw material suppliers and distributors, government agencies, and research institutes. Beginning with an executive summary that provides insights on how the demand for lead acid batteries has evolved in the recent past and what are its future prospects, the report dives into market introduction and view point including macro-economic factors. The report takes historical data from 2012 to 2026 and provides forecasts during the period of 2017 to 2027. The report segments the lead acid battery market on the basis of product type and application, providing key trends and developments as well as market attractive analysis. Moving on, various regions and countries have been evaluated for the potential of demand they are promising in the near future. The report concludes with an elaborated chapter on competitive landscape, in which numerous key players have been profiled for their product portfolio, regional presence, and recent strategic decisions. The primary research is a collaboration of present and future scenario. It includes major drivers, restraints, opportunities and trends, key challenged faced by manufacturers and customers, key winning strategies followed by manufacturers, and market segmentation criterion. The secondary research included automotive production trend and forecast across geographies, telecom industry production trend and forecasts, technology comparison and performance criterion, key researches by organizations and industry associations. Some of the key sources referred to are: industry association publications, annual reports, publications, presentation of automotive companies and lead-acid battery manufacturers, and OICA, SIAM, AMRA, ACEA, OESA, ASA, NAATA, JAMA, CAAM, ASEAN Automotive Federation and Government Websites. 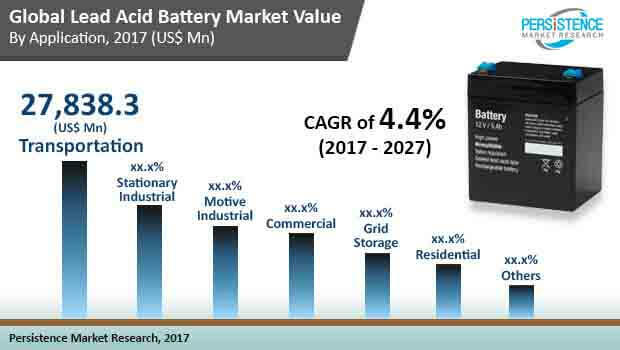 The analyst of this report on the global lead acid battery market have also collected information via industry experts, lead-acid battery manufacturers, association members, automotive industry professionals, automotive component suppliers, and integrators and MRO service providers. Based on product type, the report segments the lead acid battery market into AGM battery, gel battery, and flooded battery. Application-wise, the market has been categorized into transportation, motive industrial, grid storage, commercial, residential grid storage, and stationary industrial. Geographically, the report gauges the potential of demand for lead acid battery that can be expected out of Asia Pacific excluding Japan (APEJ), North America, Latin America, Western Europe, Eastern Europe, the Middle East and Africa, and Japan. For each of these regions and countries, the analyst has included historical data on how the demand has increased since 2012 and forecasted what peaks it can attain by the end of 2027. Portability of power supply has always been invaluable for the humanity. And, lead-acid batteries have been serving the purpose for over a century, evolving considerably since its invention in 1859. Currently, lead acid batteries are used for diverse applications in various end-use industries such as automotive, uninterruptible power supply (UPS), and telecommunication. And in the near future, according to this business intelligence report, the demand will remain potent, expanding at a CAGR of 4.4% during the forecast period of 2017 to 2027. In terms of revenue, the analyst of the report has evaluated that the global lead acid battery market will be worth US$94,821.6 mn by the end of 2022. Volume-wise, the demand for lead acid battery is forecasted to be 881,280 units by 2022. These two figures are substantially more than the corresponding numbers for 2017 – US$ 61,482.2 mn and 613,777 units respectively. Some of the key factors identified as drivers of the global lead acid battery market are: increasing demand for e-bikes and electric vehicles, lower maintenance and replacement costs, and reducing reliance on conventional fuel technologies. On the other hand, stringent lead emission standards and shift towards lithium-ion batteries are two glaring restraints hindering the prosperity of the lead acid battery market. Nevertheless, increasing demand from the telecommunication sector is foreseen as a fresh new opportunity in this market. Product-wise, the market for lead acid battery has been segmented into AGM battery, flooded battery, and gel battery. Among these, the flooded battery segment provided for 66.1% of the total demand as of 2017. Although the demand share of flooded batteries is anticipated to lose a little ground over the course of the forecast period, it will continue to remain the most profitable segment until 2027 by a fair margin. Economical pricing of flooded batteries make them high in demand. The demand share of AGM battery is poised to increase considerably in the near future, expanding at an impressive CAGR of 6.9% during 2017 to 2027. Application-wise, the analysts have bifurcated the lead acid battery market into grid storage, commercial, stationary industrial, residential grid storage, motive industrial, and transportation. Until 2017, the transportation sector was providing for 47.3% of the overall demand, although the demand for stationary industrial segment is expected to expand at an above-average CAGR of 6.3% during the forecast period. Geographically, the region of Asia Pacific excluding Japan (APEJ) is currently most lucrative and the demand is projected to expand at an above-average CAGR of 4.8% during the forecast period of 2017 to 2027. By the end of 2027, the APEJ lead-acid battery market is estimated to be worth US$19,631.1 mn, with the flooded battery segment providing for the maximum demand. Flooded batteries, also known as wet batteries, uses lead plates, sulphuric acid electrolyte, and plate battery. Although flooded batteries require maintenance, they are cheaper and come in various shapes and sizes, making them ideal for various applications. China currently dominates the APEJ lead-acid battery market in terms of demand. The country accounted for nearly 50% share in the overall lead-acid battery consumption in APEJ in 2016. While North America and Western Europe are other two regional markets with substantial potential, demand from both is anticipated to increment at a sluggish growth rate on the back of growing adoption of alternatives.